One potential application of electronic tongues is to help the industry produce their signature drinks more efficiently, said Manuel del Valle, a professor of chemistry at the Autonomous University of Barcelona, Spain. Anheuser-Busch, for example, probably wants to make sure that every bottle of Bud Light tastes the same before it hits grocery and liquor store coolers. This means that one expert must always test the beer before it leaves the factory. "But your experts don't work at 3 a.m. and they don't work on Sunday," said del Valle. Electronic sensors could share a supporting role by continuing to check the beer while the brewmasters are sleeping. "Humans are still better," said Méndez, co-author of the study published last month in the Journal of Food Engineering. "At least for now, they are far from being replaced." Which is why the researchers designed the device to function like the human taste system, said Méndez. When we eat, sensors nestled in the taste buds react to molecules in the food and send the appropriate signals to the brain: sweet, savory, bitter and so on. The electrochemical patterns of those signals register in the brain as flavors. All receptors respond every time we take a bite — we don't have specific sensors for different tastes. "Since you are a little baby, you train your brain and sensors so your brain learns that this taste is from a banana, this taste is from coffee," explained Méndez. You compare sensory response patterns for every mouthful of food, "then you decide it's a banana because you've tasted it before." The study's electronic tongue emulates a simpler version of this process. The screen-printed electrodes, made by the company DropSens, have an array of sensors that send signals to software — the "brain" — that analyzes the response patterns. The device is portable — about the size of two cigarette packs, said Méndez. There are four electrodes, each made from a different material. These detect polyphenols, antioxidants produced by the grains and ingredients that ferment into beer, such as barley and hops. Phenols give beer its bitter taste, determine its golden color and conduct electricity. The electronic tongue distinguishes between lagers by detecting the different concentrations of polyphenols. A beer is classified as a lager based on the type of yeast and a low fermentation temperature. 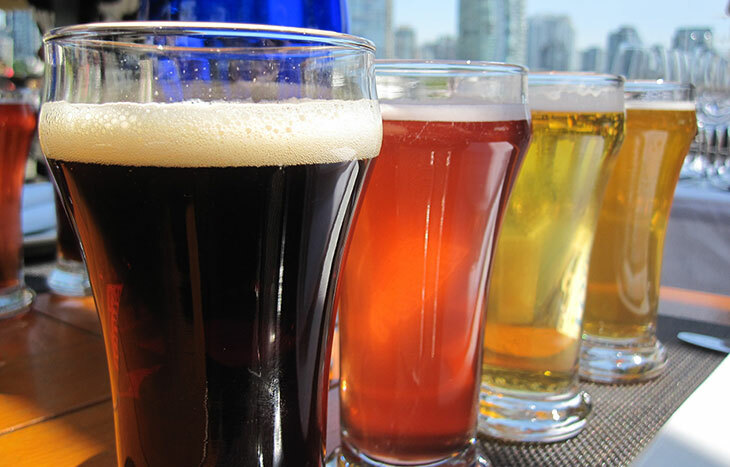 There are a variety of lager styles depending on certain characteristics, such as color and alcohol content. Méndez and her colleagues tested the electronic tongue on 25 types of commercial beer across four lager styles. The researchers chose the styles based on their distinct alcohol strength and the European Beer Convention color value. The four styles were alcohol-free beer, which has low polyphenol levels; Pilsners which have a light yellow to golden color; doppelbock, which is a dark brown, malty lager; and European strong lager, a European version of malt liquor. The researchers taught the software to recognize the signal patterns for each of the four lager styles. Like our brain, the computer can then compare new beer samples against the established, learned signal patterns. They tested each of the 25 beer samples seven times. Many existing tongues using an array of sensors only get one data point for each sensor, said Méndez. "But we have curves for each sensor." The non-specific electrodes are responsible for their wealth of data. The phenols and electrodes send electrochemical signals to the computer as they interact. The researchers immerse the electrodes in beer and track the electrochemical signals as they turn up the voltage, said Méndez. Each sensor makes distinct electrical patterns because each is made from a different material. After analyzing the data with two pattern-recognition models, the electronic tongue was able to place the commercial beer sample into the correct lager category with 100 percent accuracy. It also predicted the beer's color with 76 percent accuracy, and its alcohol content with 84 percent accuracy. "Their sensors generate one vector of, say, 100 numbers," said del Valle. He published a paper last year describing his lab's electronic tongue that used an array of specific electrodes, which correctly identified between lager styles 82 percent of the time. "We use a larger number of sensors related to ions but got poorer information. [These researchers] use less sensors, but is richer in information they generate," said del Valle. He was not involved in the study. The next steps for Méndez and her team will be modifying the commercial screen-printed electrodes with nanoparticles to make the sensors respond more clearly, she said. "These systems are complicated and though they are improving little by little … they are still very far from human senses," she said.